My Digital World | … and welcome to it. I am a little bit geek but not anywhere near as hard-core as some people, such as my husband (Jeff Ash of AM, Then FM fame). But I am pleased to announced that I just moved my blog from its old location on Posterous to its grown-up location here (I bought my first domain, too! Whoo-hoo!). Now that I have bridged that divide, I will be providing content more regularly on lots of topics, such as email, social media, life as the parent of a high school show-choir kid, actually anything that comes to mind. Suggestions are welcome. No, I’ve never met this marketing/social media/thought leader/smart guy, but I’ve learned a lot from him about all aspects of digital marketing. So, he was one of the first people I added to a Google+ circle once I was allowed to sneak under the velvet rope. And then it began. Chris Brogan’s first post in my new news stream. Then, replies to the post – first 10, then 20, then 50, all showing up in my news stream. Then another post. More replies. Then I commented. Then I started getting email notices every time someone replied. After 30 emails in my Gmail account, it was time to shut off that email notice in Google+ settings. I know I can segment what I see in my stream by circles. And it isn’t Chris himself that’s making me spend a lot more time trudging through the stream but all the replies. Steve Rubel is excited about the global nature of the conversations his posts inspire … but honestly, I’ve got my work cut out for me just keeping up with him, with Chris and all the other smart people who are helping me find a path through the Google+ thicket. So, Chris, my good virtual friend and inspiration, I’m pulling you out of the circle unless I can figure out a way to increase the signal and reduce the noise … but even though we’re breaking up on Google+, I’ll keep you on my Twitter list, where I can keep up with you, and only you. A tip from ReadWriteWeb for people who are migrating to Google+ from Facebook or want to have a backup home online. Note: You have to use Google Chrome to make this work because you have to use a special Picasa app. Michele Bachmann is not a feminist but she is running for president. Michele Bachmann, a congresswoman and a lawyer, is running for president. Michele Bachmann is a mother and a foster mother and a wife and she is running for president. What part of this makes any sense at all? Michele Bachmann, according to recent news, went to law school because her husband told her to. Bachmann is running for president, but believes that women should be submissive to their husbands. Who then is running for president? Is it Michele Bachmann or her husband? Who, if she is elected, will run the country? More importantly, how can we even take her seriously? But people are. She has a growing group of supporters and a growing pile of campaign contributions. People were furious when President Bill Clinton suggested that Hillary, his wife, would help him in his presidency. But now we have a presidential candidate who says that all her decisions are essentially made by her husband, an unsavory character if there ever was one: a man who “counsels” gay men and women out of their homosexuality. Now we have a woman candidate for the presidency who not only denounces the idea of being a feminist but defers to her husband in matters as important as her education. Michele Bachmann calls herself an “empowered” woman, but not a feminist. From where then does her empowerment come? Were it a gift from the God she so lovingly mentions, wouldn’t it have been easier for Him to just go ahead and pass the Equal Rights Amendment (which never passed). Wouldn’t He have just made it simpler and easier for women to rise to the top of major corporations? How about making it a no brainer that women would receive equal pay for equal work? If God were in charge, wouldn’t the issue of women’s right be a non-issue? Or is God just choosing Ms. Bachmann over the millions of other women who would very much like the kind of “empowerment” Bachmann says she has? The millions of women who raise children alone, who work at minimum wage jobs, who handle the bulk of the childcare and home care if they are married, the women who are abused and killed by their husbands and boyfriends, the women who are mutilated by societies who feel that women are not equal citizens: why does He choose Ms Bachmann over all of them? Why does God allow Bachmann empowerment and not the women of Saudi Arabia who only wish to be allowed to drive a car? Why does God allow Bachmann the “right” to run for president but doesn’t interfere in selective abortion of girls? For hundreds of years women have fought hard to be more empowered: they have marched for the vote, for birth control, for legal rights over their children. They have fought for wage equality, and justice equality. And still women fight for their rights every day: in the home, in the court, in the work place. But Michele Bachmann can’t give a nod to those who made is possible for her to be a congresswoman and a lawyer and a mother and a wife and run for president of the United States. Instead Michele Bachmann defers to her husband as the boss, and to God as her larger boss. No wonder she won’t call herself a feminist. Michele Bachmann would not be a congresswoman were it not for feminism. Michele Bachmann would not be a lawyer were it not for feminism. Michele Bachmann would not be able to juggle the demands of home and family and work were it not for feminism. Michele Bachmann would not even be able to think up becoming president were it not for feminism. Michele Bachmann is separating herself from the hundreds of thousands of women who made is possible for her to get where she is. And finally, Michele Bachmann would not even be worth writing about and railing against were it not for the feminists who fought so long and hard before her. Isn’t that ironic? If she weren’t so annoying, Michele Bachmann would scare me silly with her Presidential ambitions. This article by my fellow feminist friend and writer Lisa Solod explains why, better than I could. Down in the comment section, my favorite comment is by someone who disagrees with Lisa: “Actually I like Bachman. She is smart, quick on her feet, well educated, married with children in a normal male/femal­e family and she recognizes that small businesses create jobs. Sure, she’s a swell person. But being a good wife and mother doesn’t qualify you to be President. If that were the case, I could come up with hundreds of other women, all Republicans, who would do the job better. Read Lisa’s commentary, and post an opinion. You’ll get a temperate, intelligent response, whether you agree with her or not. 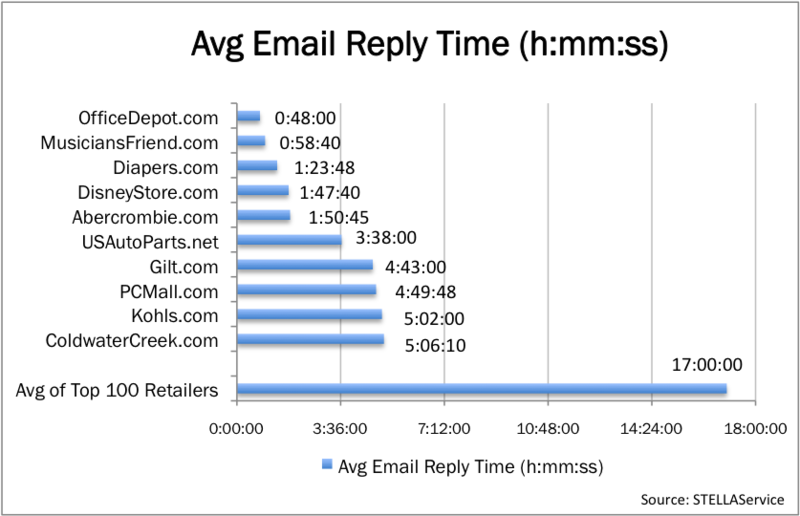 STELLAService tracked the response times of Top 100 Retailers and found Crate & Barrel took 88 hours to reply to a customer service email. At that rate I could have bicycled down to company HQ in Naperville. Seventeen hours on average isn’t pretty, either. Monitor those inboxes, people! The earliest of the early adopters are now reporting back from the frontier with advice and tips. Here’s a great list to get started. 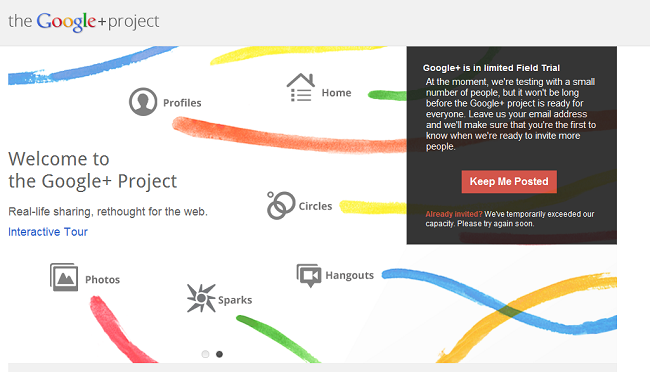 If you want an invite to Google+, just send me your email address.